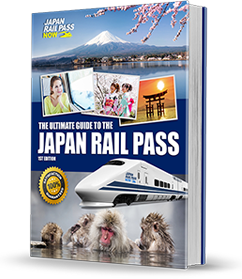 Just like everywhere else in the world, Japan observes a long list of festivals all year round, and some are several centuries-old traditional festivities that were introduced by the Chinese many, many years ago. A lot of these celebrations are to honour a deity or to commemorate a specific historical event, usually held every year, and may last for one day or even as long as a month. Aoi Matsuri – Observed in the city of Kyoto, Aoi Matsuri is one of Kyoto’s three most famous festivals (along with the Gion and Jidai festivals). 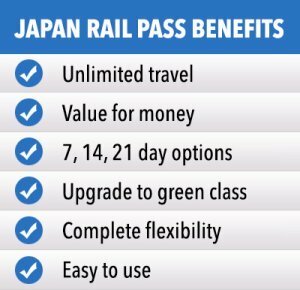 It involves a parade comprised of more than 500 people wearing Heian Period aristocratic costumes. The procession is held on 15 May every year with the parade beginning at the Kyoto Imperial Palace and concluding at the Kamo Shrines. 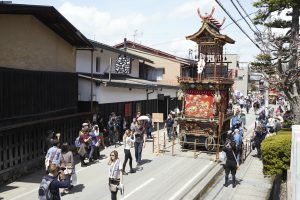 Takayama Matsuri – The city of Takayama in Gifu Prefecture observes the Takayama Matsuri twice each year, on 14-15 April and 9-10 October. The April festival is to celebrate the Hie Shrine in the southern part of Takayama’s old town and the October festival is to celebrate the Hachiman Shrine in the Northern part of Takayama’s old town. The festivals include large floats that have been lavishly decorated and are paraded around town. Sanja Matsuri – Considered to be one of the three biggest festivals of Tokyo, the Sanja Matsuri is held on the third weekend of May in the Asakusa district. Portable shrines, or mikoshi, are elaborately adorned and carried through the streets. 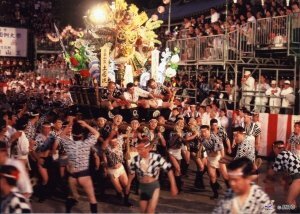 The Shinto gods in the parade are said to bring good fortune for the local businesses and residents. Kanda Matsuri – Observed on a weekend in the month of May on odd numbered years (e.g. May 2017, May 2019), the Kanda Matsuri consists of a one-day procession around downtown Tokyo and mikoshi parades through the streets. Gion Matsuri – This festival of Yasaka Shrine is observed every July and is highlighted by a parade of floats at least 20-metres tall. The Gion Matsuri in Kyoto is one of the top three Japanese festivals. Hakata Gion Yamakasa – Held in Hakata in Fukuoka every 1-15 July, the Hakata Gion Yamakasa is an exciting festival that includes a festival float race in the morning of the final day of celebrations. 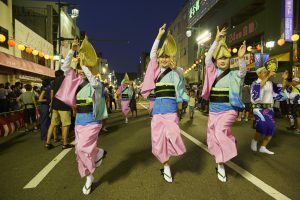 Kanto Matsuri – Held from 3-6 August, Kanto Matsuri takes place in Akita City. It features parades of more than 200 performers balancing bamboo poles on different parts of their body, with each pole holding as many as 46 lanterns. It is conducted every night for four days. 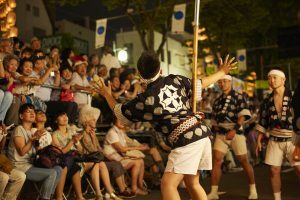 Awa Dori – Dubbed as the most popular dancing festival in the country, Awa Odori is an event held 12-15 August, right smack in the obon season. It features a procession that includes dancers dressed in various traditional costumes performing different traditional Japanese dances. 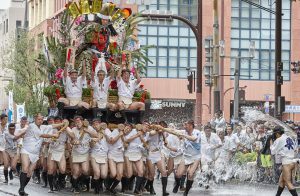 Tenjin Matsuri – A top three Japanese festival, the Tenjin Matsuri is observed every 25 July in the city of Osaka. Tenjin Matsuri is the festival of the Tenmangu Shrine, honoring its deity Sugawara Michisane, the deity of scholarship. It consists of a major procession held around the city, as well as a river parade of boats and a fireworks show. 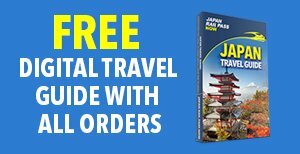 Jidai Matsuri – To commemorate Kyoto’s time as the capital of Japan, the Jidai Matsuri is observed every 22 October through a procession that starts at the Kyoto Imperial Palace and ends at the Heian Shrine. The parade consists of participants dressed in costumes from almost every period of Japanese History because Jidai Matsuri means Festival of the Ages. 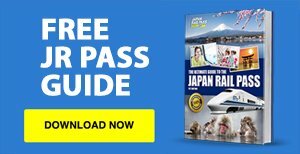 Nagasaki Kunchi – Every 7-9 October, the city of Nagasaki celebrates the Nagasaki Kunchi, where ship-like floats and dragons are paraded and displayed around the city. Chichibu Yomatsuri – Recognised as one of Japan’s most beautiful festivals, Chichibu Yomatsuri is held every 2-3 December and is highlighted by a parade of floats decorated with colourful and bright lanterns on the final night of the festivities. 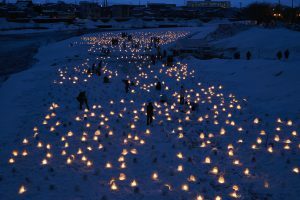 Yokote Kamakura Festival – Held in Yokote in Akita Prefecture every 15-16 February, the Yokote Kamakura Festival features several hundreds of kamakura, or snow houses that look like igloos, constructed at different locations around the city. The snow houses each have a snow altar dedicated to the water deity, where people can pray for plentiful water. Between 6pm and 9pm, vistors can enter the snow houses where they will be offered rice cakes and warm sweet rice wine to drink. In return you can make an offer to the water deity at the altar. 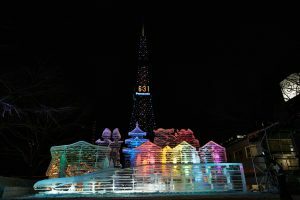 Sapporo Snow Festival – Also known as Sapporo Yuki Matsuri, this event is held over seven days in early February. During this time, different ice and snow statues and sculptures are displayed in various locations in the city. Some sculptures are more than 25 metres wide and 15 metres high, and some are even used as a stage for concerts.